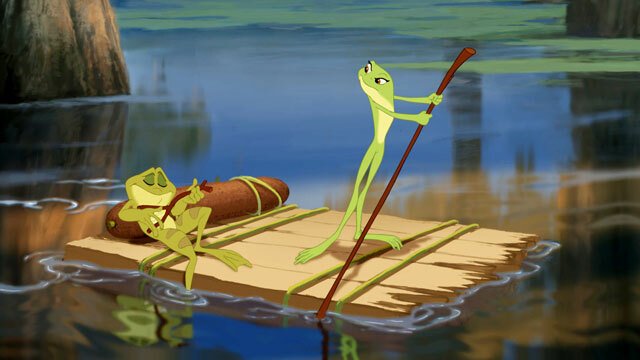 The Princess And The Frog is the return of traditional animation by Disney. The film is Disney’s own take of the fairy tail, The Frog Princess, but with a new twist. The story is about a young African American girl named Tiana. All she has ever worked for in her life was to make enough money for her own restaurant. She wishes upon a star for her dream to come true. The interesting thing is, the fairy tale of The Frog Prince actually exists in the films world and the characters are aware of it. So after making her wish upon a star, she sees a frog and sarcastically questions if she needs to kiss him to turn him into a prince. Since it is a talking frog, she finally grudgingly agrees to kiss him. Since this is a twist on the original tale, instead of the frog becoming a prince, Tiana herself becomes another frog. The story continues from there in the classic Disney animation style of the two going on an adventure while meeting new friends along the away. I think Disney did a very good job at creating the characters of the film. They are not the stereotypical fairy tale or classic Disney characters that we are use too. This is the first Disney Princess film in a very long time to feature the Princess with a mother. Out of the eight former Disney Princesses, there has only been a single Princess with both a mother and a father. The past five Disney Princesses only had a father and no one ever mentioned a mother. In this film, Tiana actually starts with both parents until her father passes away. After his passing, Tina’s motivation is living up to her fathers dream. Which is a very strong motivation for any character. The princess himself, is actually very poor. Trying to get rich again is his motivation. This seems very shallow and negative at first, but this allows room for his character to grow and change is ways and become a more dynamic character. I even teared up during a very sad moment during one of the final scenes of the film. I was completely surprised and still unable to think of another one of Disney’s animated films to have same emotional rich plot point in the film. Not only is The Princess And The Frog a return to traditional animation, but also the classical idea of it being a musical. I had almost forgot completely about the idea of singing in an animated film. It was very rare for any animated film over the past decade for a character to brake out in song and dance. This film featured many songs, maybe too many. I am not a fan of this musical style of animated films any more. It might of been fun when I was a kid, but I enjoy a more traditional way of telling a story now. Instead of a character braking the flow of a story by singing their feelings and motivations. The only saving grace was that it just reminded me of all my favorite classic Disney films and their song and dance numbers of my child hood. I actually enjoyed the very first song, because the character’s did not stop what they were doing to sing and dance to it, instead the music was just background music during montage like sequence. I hope Disney loses the complete musical style format, and instead make it more subtle background music. A very important note is that, spoiler alert, Tiana does becomes a princess. This means she is the first African American Disney Princess. There had been so many Western European Princesses, a Middle Eastern princess, a Native American Princess, an Asian Princess, and even some kind type of Fish Princess. So after already having the majority of races, and even a fictional one, it was finally time for Disney to have African American Princess. Since The Princess And The Frog is brand new, of course it is missing the nostalgia factor of all the classic Disney animated film. But I can easily see how a young generation and generations to come will classify this film in the same nostalgia category that my generation and I do for Aladdin and The Lion King. Not only is The Princess And The Frog a return to traditional animation, but also the classical idea of it being a musical. It might of been fun when I was a kid, but I enjoy a more traditional way of telling a story now. I do not believe I contradicted myself. The first sentence are two facts about the film. It is a traditional animation, and it is a musical. The second sentence is stating my personal opinion on one of them. I might have enjoyed Disney musicals as a kid, but I no longer do. When I use the term traditional animation, I am using the proper term for 2D animation, classical animation, cel animation, or hand-drawn animation. To compare it to other forms of animation such as computer/3D/CGI animation or stop motion, or many other forms. Traditional Animations do not necessarily mean it has to be a musical. Disney is the only one that does this. When I say “traditional way of telling a story now” I do not mean “traditional animation”. A musical is not a traditional way to tell a story. I back up my argument of not liking musicals with the next few sentences and it shows you how musicals are not a traditional way to tell a story. bah not as good as the manga, oh well ._.